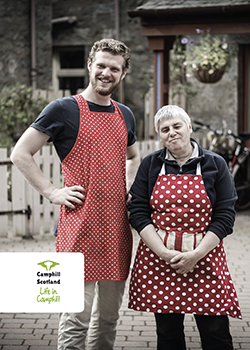 Camphill Scotland is the membership body for the 11 Camphill communities in Scotland. Together, our members support over 600 individuals with learning disabilities and other support needs, ranging from children to older people. The communities are located in a variety of beautiful settings across Scotland, from Dumfries to Aberdeen. Each offers a supportive community life with personalised opportunities to find purpose and belonging through a wide range of social, cultural and work activities. The rights of people with a learning disability to have full and equal access to social goods including work, relationships, and a cultural, artistic and spiritual life. The rights of people with a learning disability to have an equal say in how society’s resources are allocated and to shape their environments according to their needs and interests. The value of shared living as a powerful means to release individual potential and reduce isolation and loneliness. Taking a global and sustainable approach to social and economic challenges and thereby transcend narrow national or sectional interests. The value of the arts and of cultural life generally to promote individual and group development. The rights of people with a learning disability to choose where they live, and the type of support they receive. The rights of parents and carers of people with a learning disability to receive an appropriate range of support. Representing our members’ interests in key policy fora, including Scottish Parliament Cross Party groups.